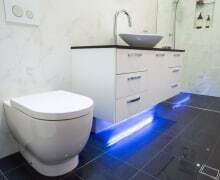 While no one has a crystal ball and can tell exactly what the future will hold, there are some emerging trends which are characterising the way Aussies are carrying out their bathroom renovation projects. And as the property market continues to change and develop we share what the future will hold for those updating their homes and in particular – their bathrooms. With housing supply remaining tight in both the rental and purchase markets, and the property market remaining flat in many capital cities many homeowners are choosing to hold onto their homes and updating their current home with the most popular room in the home being – you guessed it – the bathroom! With preferences for inner city living continuing especially here in Brisbane, people are sacrificing space to live in their chosen neighbourhood. This means that smart bathroom designs for smaller bathrooms are necessary including compact bathroom fixtures and smarter storage solutions. Along with Kitchens, Bathrooms are among the most sought after areas of the home to be remodelled and because of this are the most effective in adding value to your home since buyers will also see the value of updated and modern bathroom. Best yet, as many homeowners are discovering, there is a lot of ways you can refresh a tired looking bathroom without needing to spend much at all. The lower end of the renovation market can simply be new flooring, paint or fittings without a complete remodel being necessary. This means you are adding a significant perceived value to your home for potential buyers – all without the price tag! With an increase in bathroom renovation projects from older homes built in the 80s and 90s needing updating, we continue to forecast plenty of work for our team here at All Bathroom Gear, especially with those who are keen to add value to their home during a flatter property market. If the amount of bathroom showrooms in Brisbane popping up is anything to go by, bathroom renovation projects are expected to remain strong. When deciding who to work with on your next bathroom renovation, look no further than All Bathroom Gear – we’re Queensland’s most awarded bathroom specialist for a reason! Get in touch with us today on (07) 3391 8628 to find about more about how we can transform your bathroom.